Protein and creatine supplements can both help you to burn fat quickly, whether you use them separately or together. Combining the two may have synergistic effects to support muscle building and fat burning, according to Life Extension Magazine. Creatine allows muscles to produce energy faster, giving you more power and strength to train harder and recover faster. Proteins such as whey supply the needed amino acids for muscle repair and speed up metabolism through its thermic fat burning effect. Take a serving of protein powder upon waking up in the morning to suppress the stress hormone cortisol, which acts to slow down metabolism and burn metabolically active muscle, according to "The Cortisol Connection" by Shawn Talbott. A scoop of whey works well because it contains fast-digesting proteins that reach your muscles more quickly than whole food sources such as meat. Eat six or more protein-rich meals per day, spaced two or three hours apart, say "Xtreme Lean" authors Jonathan Lawson and Steve Holman. When taken with your meals, protein creates a thermic effect, meaning your body expends more energy digesting it. In addition, protein builds lean muscle, suppresses hunger and keeps your blood sugar low to avoid body fat storage. Choose lean sources such as turkey, chicken, fish, eggs or whey protein. Have a small serving of protein 60 minutes before your resistance training workout. According to "The Abs Diet" by David Zinczenko, this boosts muscle recovery and supplies the needed amino acids to keep energy levels high and burn more fat. Whey protein makes an excellent choice due to its fast digestion. Drink a protein shake immediately after your workout, containing a 50/50 blend of fast-digesting whey protein and slow-digesting casein. According to "Natural Anabolics" author Jerry Brainum, this mix gives you better results than taking either form of protein alone. Load creatine by taking five grams four times per day for 48 hours. According to Brainum, the traditional five days of loading wastes a lot of your creatine product because the benefits of loading diminish after this short time window. Loading supersaturates your muscles with creatine, supplying more energy for explosive strength training. 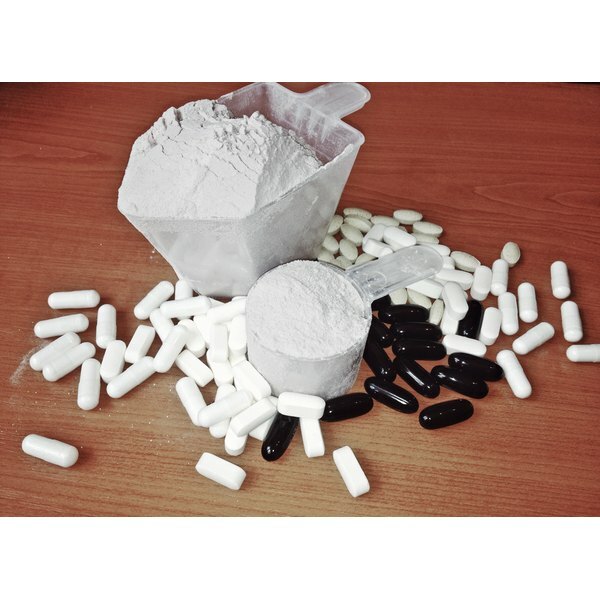 Take three to five grams of creatine before your workout to provide a ready source of phosphocreatine for your muscles. Phosphocreatine donates the third phosphate group when the body turns ADP, or adenosine di-phosphate, into ATP, or adenosine tri-phosphate. This allows you to train longer and harder in the gym before your muscles fatigue, says "Homemade Supplement Secrets" author Jeff Anderson. Take another three to five grams of creatine after your workout with some high-glycemic carbohydrates. Anderson explains that high-glycemic carbs such as dextrose, maltodextrin or fruit juices spike insulin to help drive the creatine into your muscle cells. Taking creatine after workouts improves recovery for better muscle building and fat burning results, says Will Brink in "Optimizing Muscle Health With Whey, Creatine and Glutamine." Take a three- to ten-gram maintenance dose of creatine in the morning on non-workout days. This keeps your intramuscular level of creatine high. If you do not take creatine consistently, your levels gradually return to normal. Take a two- to four-week break from creatine every once in a while to allow your natural production to resume. Drink eight 16 oz. glasses of water per day to avoid dehydration. Creatine drives more water into muscle cells, which means your total daily water intake should increase during supplementation. Never take creatine or protein supplements without first consulting your doctor. How Much Dextrose Do You Mix With Creatine for Bodybuilding? Can You Use Creatine on Atkins?